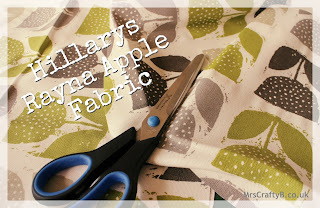 Made-to-measure window dressing company Hillarys, invited myself along with some other bloggers to take part in a challenge; to see what we could craft with 1m2 of one of their beautiful fabrics. With the launch of #MakingHome I jumped at the chance to get involved. I didn't just think along the lines of 'craft' but what I could make that was usable in my mission to create a beautiful home as well as easily replicable for you Crafty Bs. 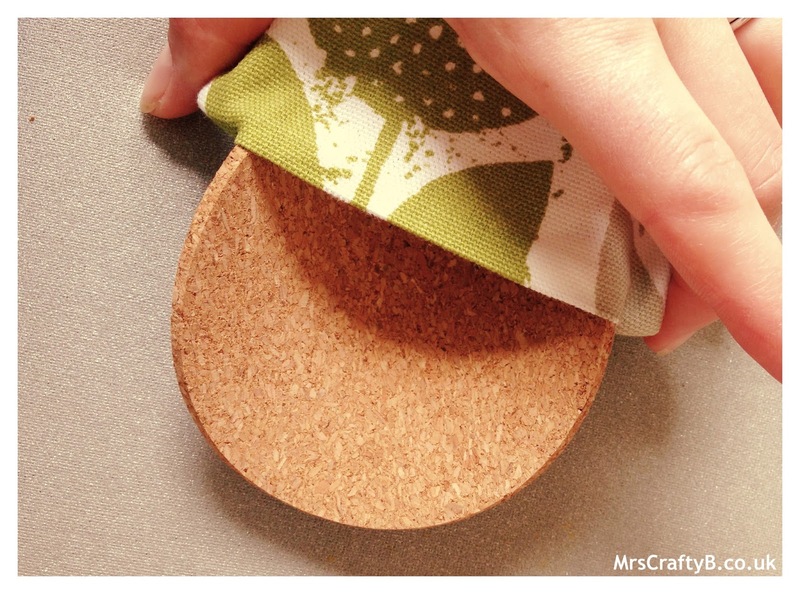 I decided I would also cover the cork coasters that we have been using (which we bought to put plant pots on initially). 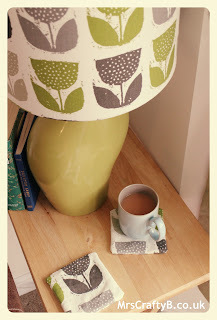 So here is how to make your lovely lampshade and matching coasters. Get your equipment together and ensure that your piece of material is trimmed to be larger than your lampshade panel but small enough to work with easily. 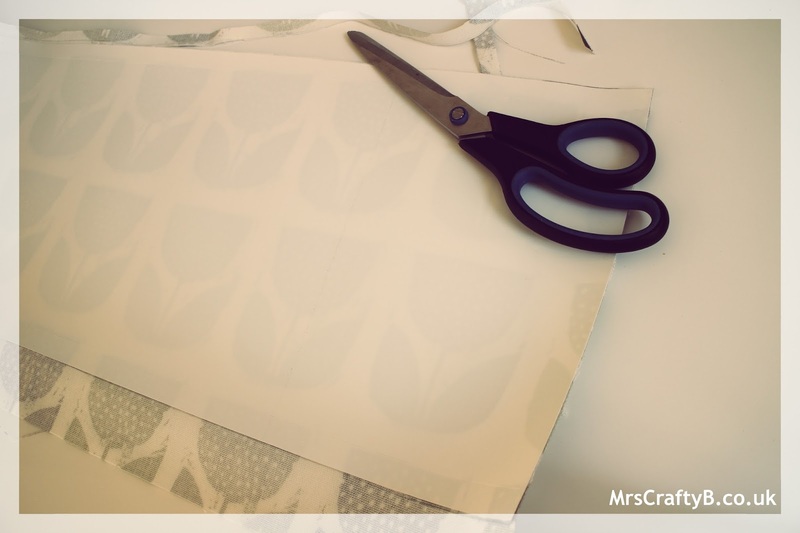 Press and lay out onto a flat surface face down placing your lampshade panel on top. 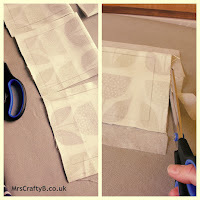 Mark around the lampshade panel onto the fabric to help guide you when sticking it down. 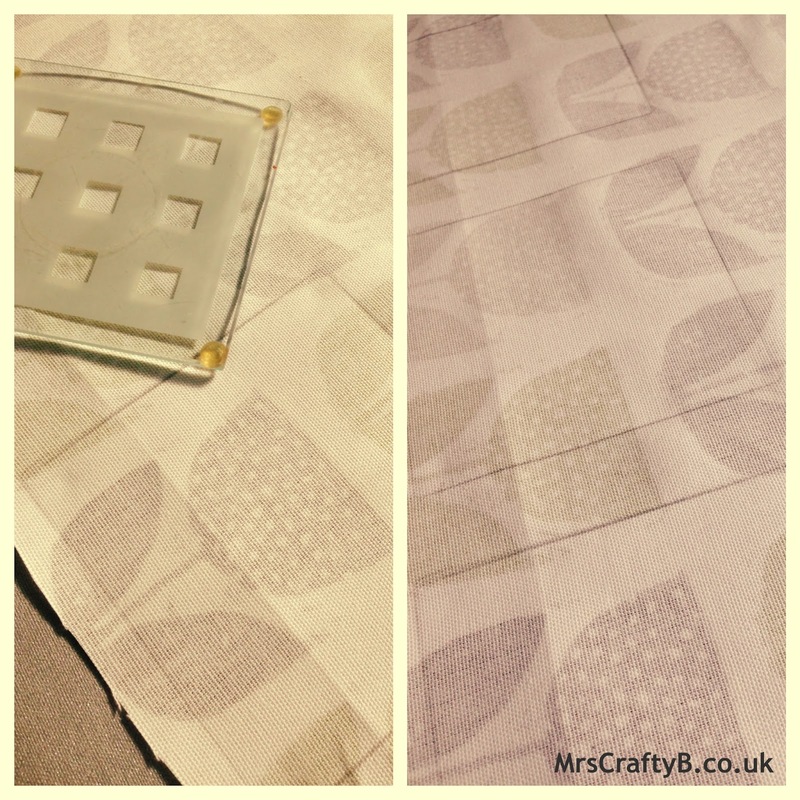 Make sure that your fabric is laid out completely flat and face down. Remove part of the backing paper from the lampshade panel (just a few centimetres) and using your guide, place it onto your fabric pressing firmly. 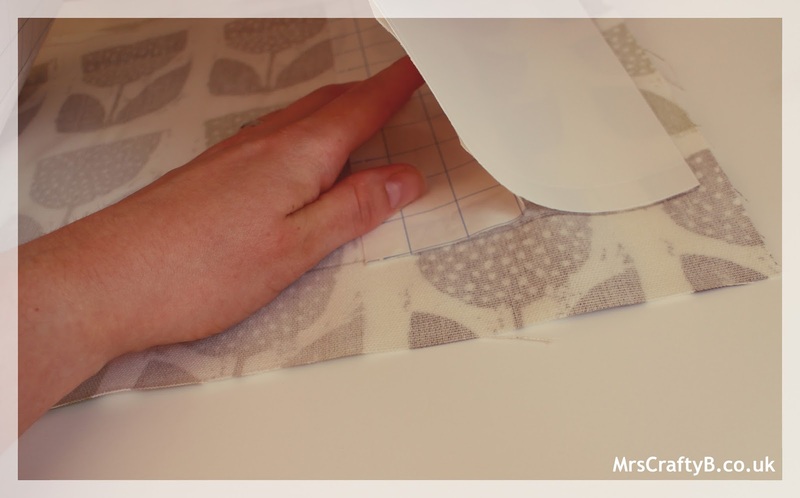 Carefully, using your guide, pull the backing paper away as you stick down your panel bit by bit. 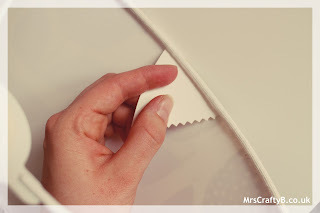 Once your panel is completely stuck down and the fabric is how you want it (flip it over and check for crinkles) it's time to get trimming! 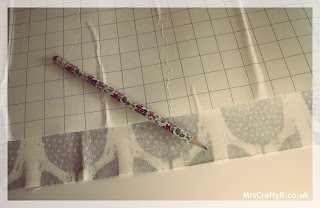 If you have a pre cut panel with a kiss cut then trim the fabric right along the edge. 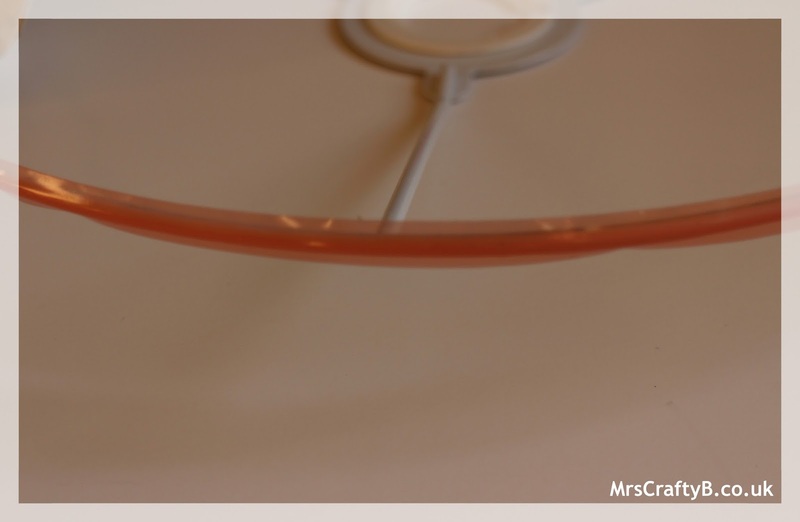 If you have no kiss cut/removable tab then leave a section of material approx 15mm along the long edges. 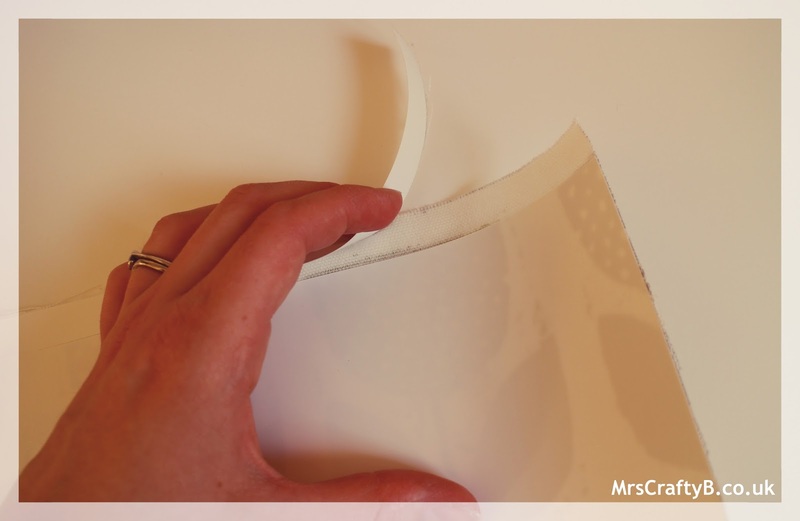 If you do have a panel with a kiss cut, then snap the perforated edge back and fourth and remove it. …now add a strip of self adhesive tape along one short edge. Don't remove the backing just yet! 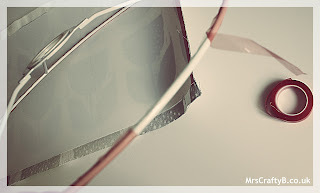 Prep your lampshade rings. 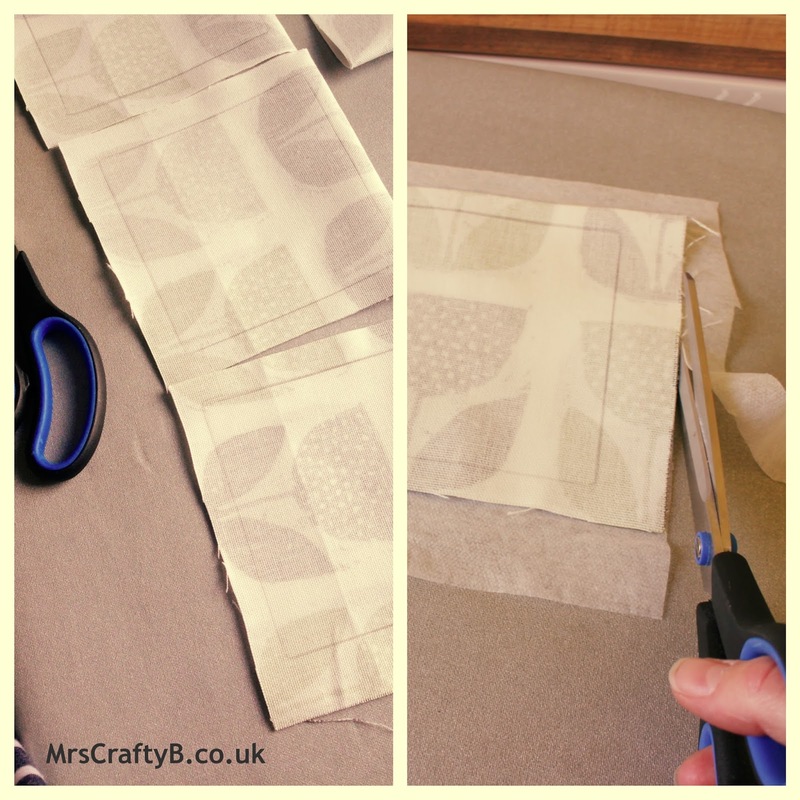 Run a piece of self adhesive tap around both rings ensuring it is wrapped right around then remove the backing. Be careful how and where you place the rings down because they will stick (and stick well). 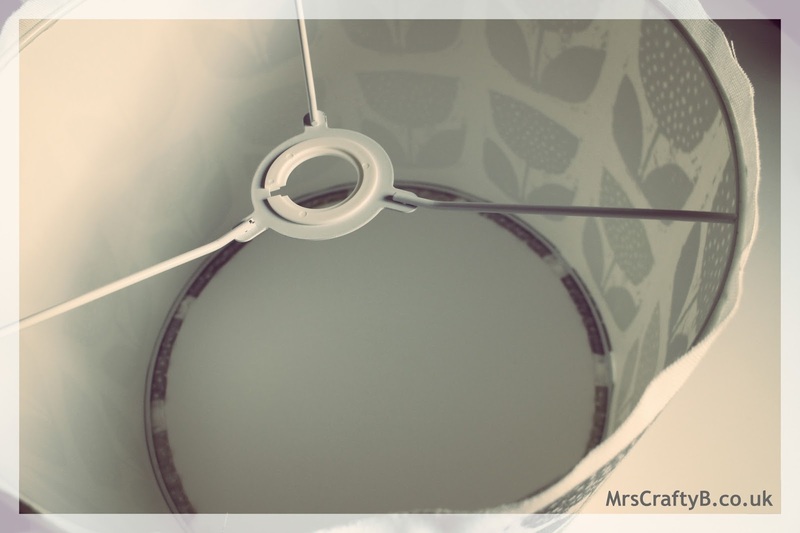 Place the rings against the edge of the lampshade panel on the end without the tape. If your print needs to be a certain way up then make sure the ring with the fitting is at the top. You should also make sure that the fitting is on the inside. Now roll the rings all the way along making sure to keep them against the edge of the panel. 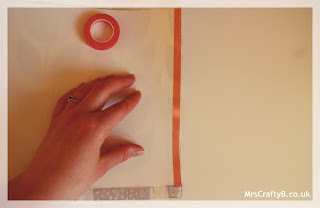 when you get to the end, remove the backing of the tape on the short edge and stick down. 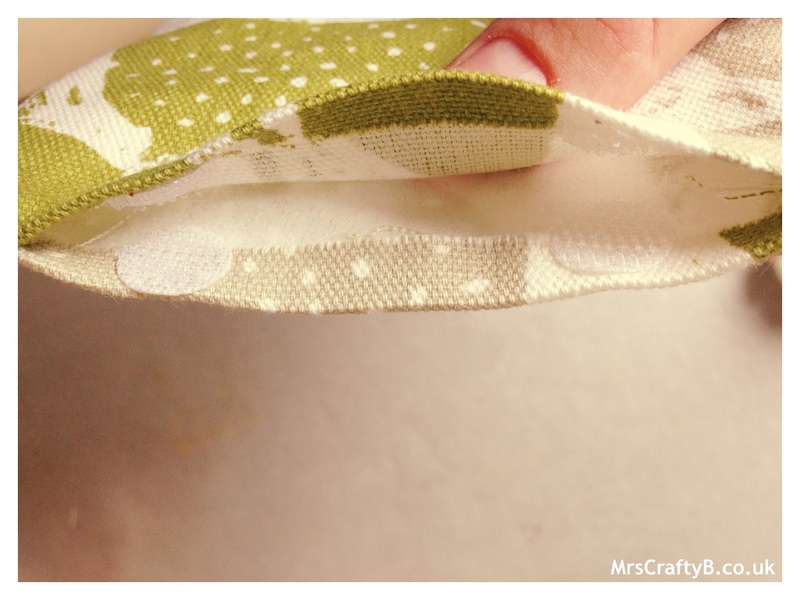 If you have the comb from a kit, use the cerated edge to tuck the excess fabric under the ring. Use the smooth edge (or your plastic store/credit card) to finish and tidy away all the loose bits. 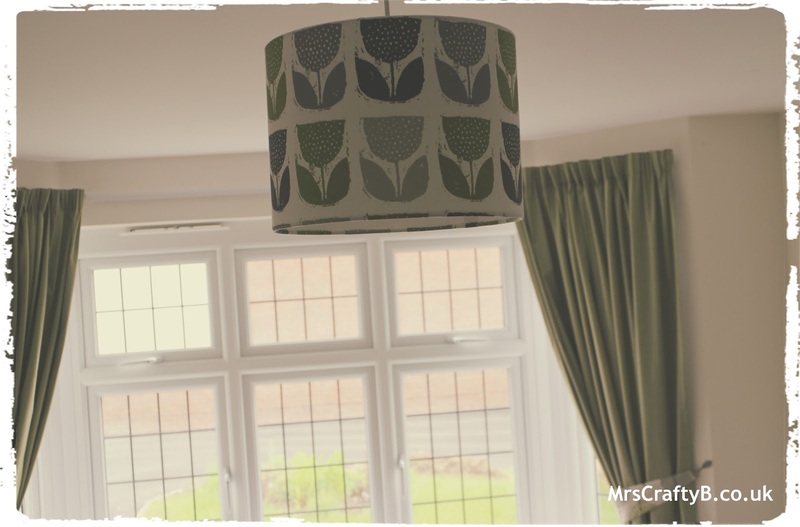 If you have the right fitting on the shade, you can use it for a lamp (like I have shown in the picture at the top of the post) but I didn't have the right fitting and my fabric pattern would be upside down it I used it the other way so I have mine hanging centre stage in the front room! 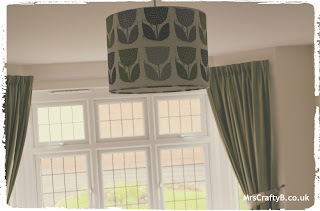 Once I had made my lampshade, I had a look at was else needed sprucing up with the rest of the fabric. 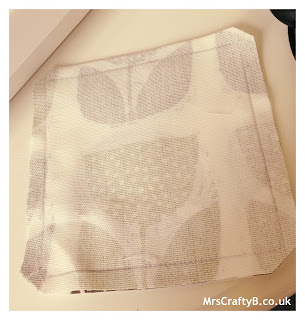 We were using some cork coasters that I had initially bought to place plant pots on so I decided to make some washable fabric coasters to replace them. Halfway through the process, I realised that my backing fabric was not heavy enough to make them sturdy so I had to change direction! But I will guide you through, giving you two options! 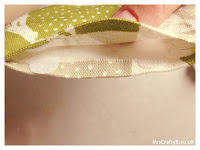 You could make removable covers like I did or just fabric coasters. Squares are much easier to sew either by hand or machine so I drew up some lines to follow. 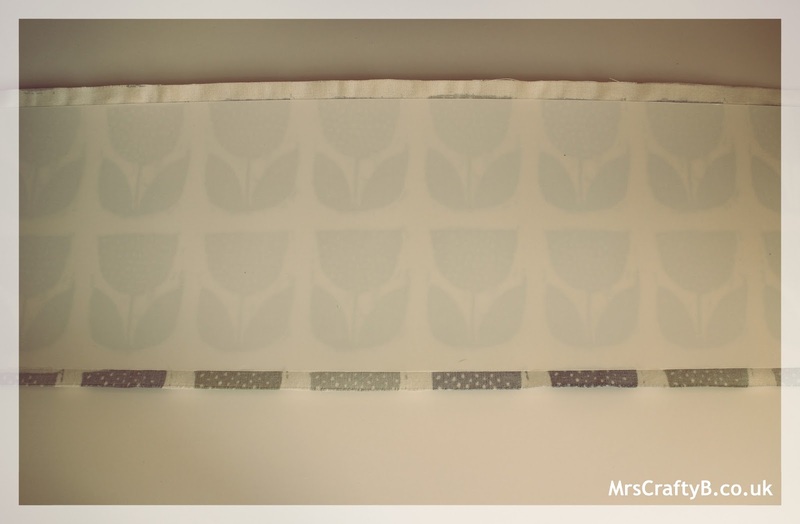 I folded a piece of the fabric in half (right side inward) and used a 10cm x 10cm coaster to draw templates on one side. Then I made a cut in between each square. Essentially you should have a doubled up square. 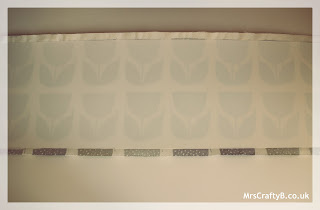 I fused some backing fabric with WonderWeb onto one side. 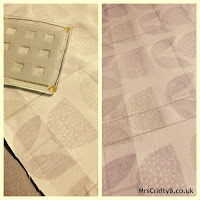 In retrospect, I would have backed the whole piece of fabric before I folded it and drew my template so that is worth doing if you are going to make the covers REMEMBER: If you are going to make fabric coasters rather than 'covers', use a heavy weight backing fabric. Now for the sewing bit. Either by hand or machine, begin sewing 1cm in on the top line from the top right corner as you look at your template. 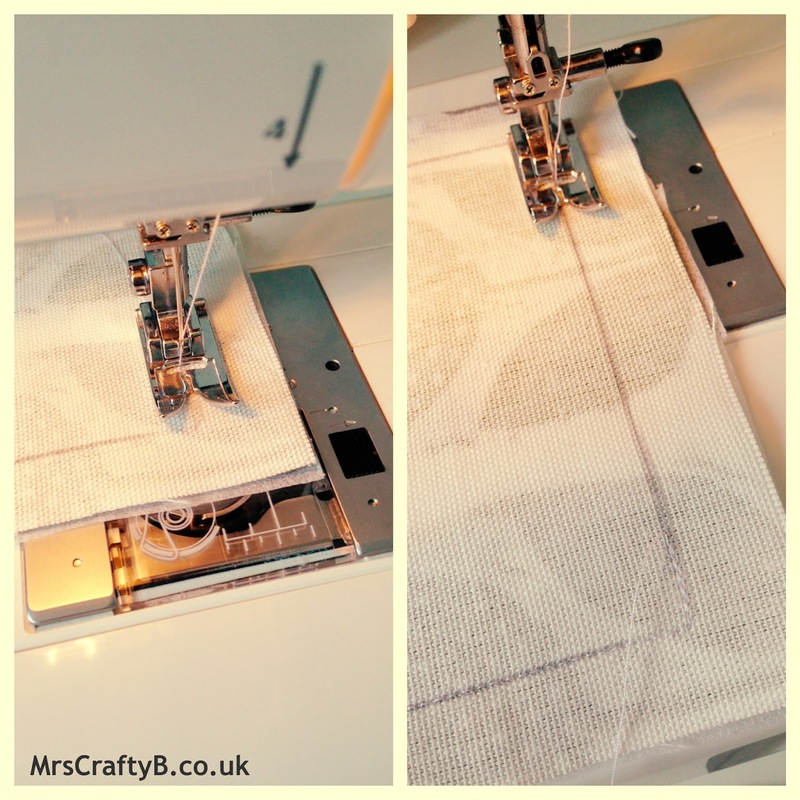 Turn on the corner, sewing the entire square, finishing 1cm in from the top left corner on the top line. 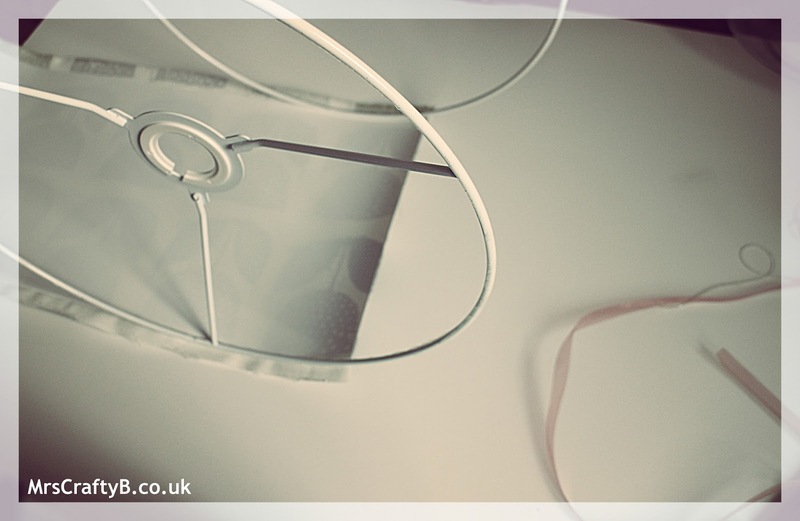 You should have a gap big enough to turn your coaster the right way round. Because we have sewn with lines as a guide your seams might be large, trim them up and snip the corners. 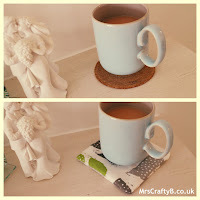 If you are making fabric coasters and you have backed both sides with heavy duty backing fabric or fabric stiffener, turn your coaster the right way, using a blunt tool (maybe the wrong end of a pencil) to push out your corners. Press and sew closed the open edge. My backing fabric wasn't heavy enough so instead of replacing the cork coaster, I decided to brighten them up. 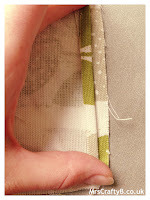 Before I turned my covers the right way out I used some WonderWeb to press down the open seams. …VOILA! 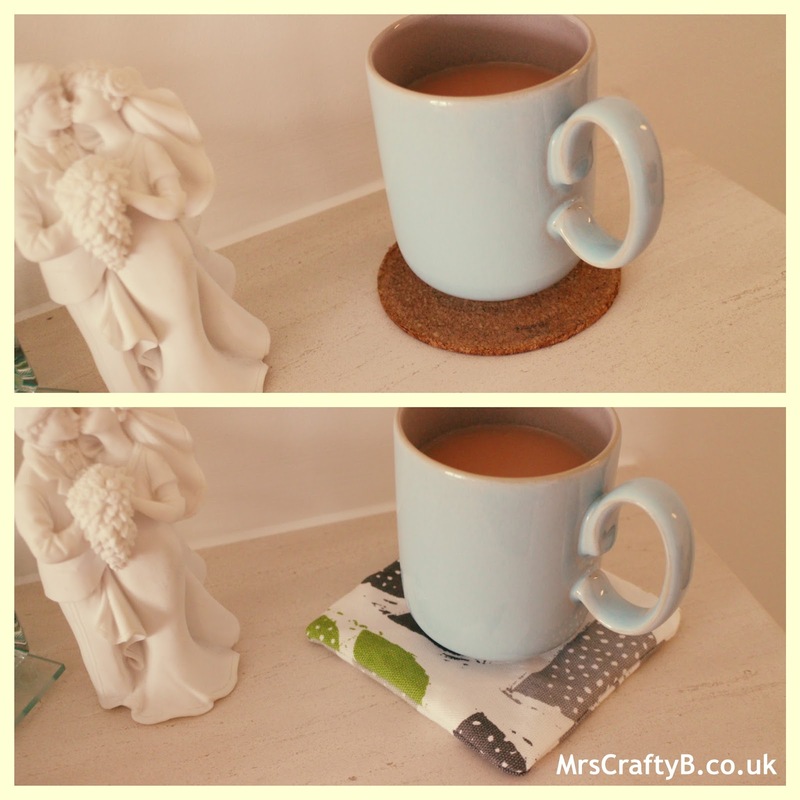 Boring cork coaster to lovely bright co-ordinating coaster! I hope you have been inspired to go and get a lampshade kit and don't forget that if you are also in the throws of #MakingHome, Hillarys might be worth a little look! 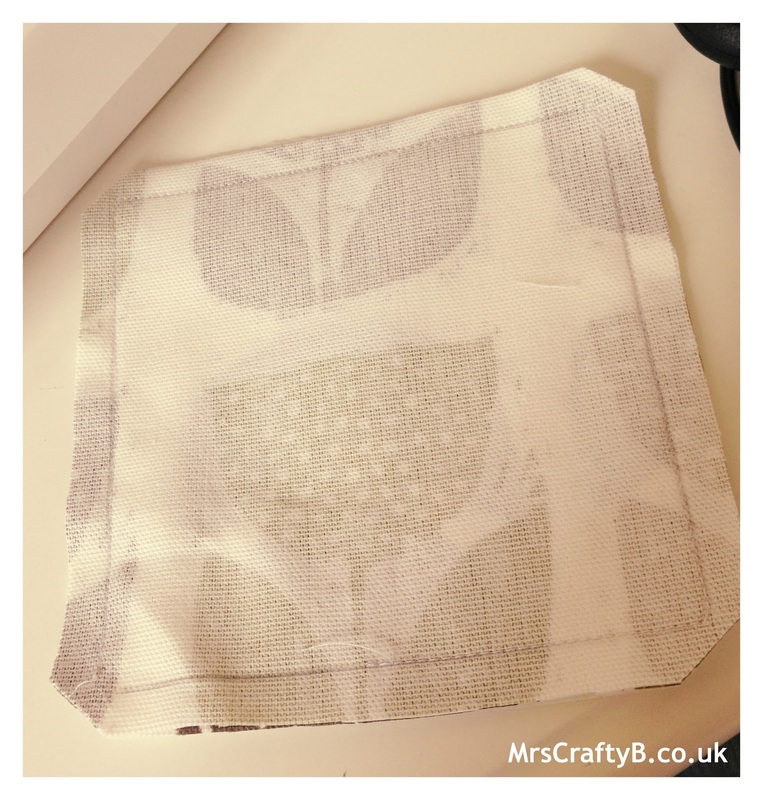 Pop along and share your projects with the Crafty B's on the Mrs Crafty Facebook page and let me know if you decide to have a go at either of these projects! I love your lampshade! You make it look so easy! I have a lighting thing and would love to make my own! It was genuinely easier than I thought it would be! I recommend it to all and everyone ha ha! I never make anything these days but I'd love to get back into it as I enjoy crafty stuff so much. These look great too! I love the lampshade so much! Honestly Leesha it was so easy. Get a kit and have a go. You won't regret it. You can use wallpaper too! You are very talented and the shade and coasters have been made beautifully. 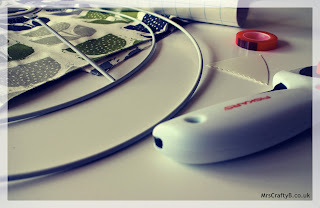 Love the lampshade, really want to have a good at making one myself! Thanks Hannah. I will be surprised to make final 10 but here is hoping! You should get a kit! It was super easy. I sort of made it up as I went but I knew I needed something to cover the cork ones. I've wanted to have a go at this for ages but always talked myself out of it because I thought it was too difficult. Thank you for the step by step instructions, I'll have a go now! It is honestly so much easier than it looks! Have a go! Let me know how you get on. 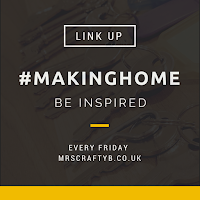 #makinghome I just signed up to do a little workshop for this ! Looks great! I can't wait to see what you make. It was so much fun and a lot easier than I thought it would be! Oh do! I bet they will be beautiful. Don't forget to share the results. Would love to see them!